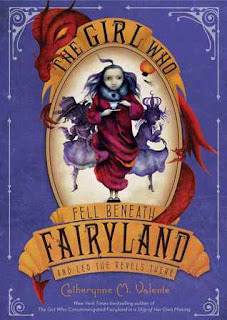 The Girl Who Fell Beneath Fairyland and Led the Revels There is the second book in Catherynne Valente's trilogy about a girl named September who visits Fairyland and has a great impact each time she goes there. I loved the first book, The Girl Who Circumnavigated Fairyland in a Ship of Her Own Making, and was looking forward to reading this one. I've loved every book I've read by Valente - she really steeps herself in her settings and the language and everything, and tells a seriously good story. We pick up this book a year after the last one ended. September is living in Nebraska with her mother. Her father is still off fighting in a war. September loves her mother and the time they spend together, but she dreams of returning to Fairyland. And so she does by catching a boat going over the amber waves of grain and falls into Fairyland, expecting to see her friends and have a jolly good time. But all is not well in Fairyland. In the last book, September lost her shadow, and now many others are suffering the same fate. The magic is seeping out of Fairyland and, parallel to life in Nebraska, everyone must make do with ration cards. (I loved the way Valente mirrored September's world in Fairyland and Fairyland-Below, making the story so much richer and meaningful to read!) September knows instantly that this is all her fault, that it's her shadow in Fairyland-Below causing so much trouble. Being the intrepid young woman she is, September sets off to right this wrong. I wish I had re-read the first book in this series before starting the second because there were many allusions to the events and characters in the first. I was very fuzzy on the details - I don't remember the events of the first book so much as I remember my delight in reading it. This left me at a disadvantage, especially because most of the characters who populated the first book were not present in this book, so the references to events in the past were brief and not enough for me to remember what went on. This book is more about September herself than the previous one was. She has companions in this book, too, but they are only with her for brief periods of time before she sets off without them again. And none of them is quite so nice or charming as her companions from before. I missed her friend Ell the wyverary and Wednesday the marid, but September herself is just as wonderful as she was in the last book. She is brave and smart and a little abrupt and impatient. She does things that frighten her and forgives people who have wronged her and helps those who need her. We can see her heart growing, her brain beginning to grasp just how complicated life can be, and the way people's pasts can haunt them. For example, September's shadow who is pulling all the magic down into the underworld has all sorts of nuances to her. I fully believed in the reasons behind her actions, and the justification she had for them. So many well-meaning people can create havoc in the world, and Valente acknowledges that here. I also really appreciated that September and her shadow respected and trusted each other, even when their views differed. They were rivals, yes, but there was so much between them that you never really thought of September being "right" and her shadow being "wrong." You just understood that they were on different sides of a very important debate. Another character who was fleshed out even more in this story is the villain from the previous one, the Marquess. She, too, became three-dimensional, and we learn more about what drove her to act the way she did. I am so looking forward to seeing how the Marquess evolves in the next book. The structure of this book is very similar to the last one, and again, I was strongly reminded of The Phanton Tollbooth with all the wordplay and characters that had such specific and fascinating occupations, and the obvious fun that Valente had in coming up with characters an settings. There is another book expected in this series, and I greatly look forward to it. While I didn't love this book as much as I did the first - mostly because none of the secondary characters caught my heart the way those in the first did - I did love September and look forward to seeing her grow even stronger. She's a fantastic character with a lot of heart and soul. It's hard sometimes when your reading of the last book in the series was so long ago that you forget the major plot points in the next book, but I think you did a great job with explaining your very positive reactions to the story, and particularly to the character and her nuances. I really need to read these books. They sound rather intelligent and deeply rooted in imagination and feeling. Wonderful review as us usual today, my friend! I do remember seeing the other book around..a LOT. And peeps sure enjoyed it. I did not like the first book quite enough to buy it, but definitely enough to read the sequel. And enough to slightly wish I had someone to buy the books for because they would match so pleasingly. OH how I love a matching set of books. I forgot that I had this from Netgalley, so I haven't had a chance to read it yet and soon my pre-order will be here. I am terrible with e-books and 'out of sight, out of mind'. I don't like it when I can't remember the first book in a series, or exactly what happened in the subsequent ones. Normally I try to read them close together but it doesn't always work. I've been thinking about getting the first in this series, and knowing that you loved it and the follow-up was still good definitely pushes me more in that direction. I didn't like the first one, but my daughter loved it. Sounds like this would be a good one to pick up for her. Like Trisha, your reference to Juster's classic makes me want to make a run for this one. But I haven't even read the first one yet, and knowing how terrible my memory is, perhaps I should wait for the series to finish and immerse myself completely!